1 What Is A Torn Meniscus? There are two types of cartilage in the knee joint, articular and meniscus. The meniscal cartilage is crescent shaped and cushions the lower part of the thigh bone (femur) and the upper part of the shin bone (tibia). This cushioning prevents bone rubbing against bone and the development of pain and osteoarthritis. The function is also to absorb shock and distribute the weight load across the knee joint. There are two menisci in the knee joint, one on the outside of the knee (lateral) and the other on the inside of knee (medial). The menisci are made of fibrocartilage, containing fibers of collagen that help maintain the shape. When the meniscus is torn or damaged weight is no longer applied evenly across the bones, resulting in grinding of bone-on-bone. Only the outer rim of the meniscus is vascularized, the remaining 4/5 is avascular and does not receive blood supply. A torn meniscus can require immediate attention when part of the cartilage has displaced into the joint and does not allow the knee to completely bend or completely straighten. Although more common in athletes, a torn meniscus can occur during activities of daily living, or while participating in recreational sports, such as dancing, skiing or bowling. Causes of a torn meniscus commonly include athletic trauma or are related to the aging process. A traumatic tear can occur when a sudden weight load is applied to the tissue severely enough to cause the cartilage to fail. This most often occurs during a twisting injury or blow to the side of the knee, such as a football clipping injury or falling backward on the heel with rotation of the lower leg, such as slipping on ice or down stairs. In people under the age of 30, this requires a fairly severe injury. 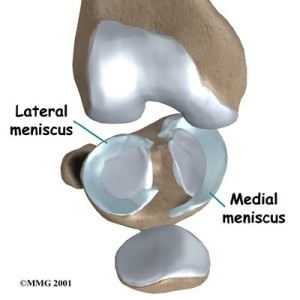 Torn menisci can also occur from reduced compliance and failure related to the natural brittleness that occurs as the meniscus ages., Failure in this instance requires only a minimal trauma; occasionally no memorable injury can be recalled prior to the damage. Patients may experience pain on the side of the knee, lateral or medial, where the tear occurred. Small amounts of swelling may occur the next day, associated with limping and stiffness. Further damage and increased pain will be experienced with twisting motions, squatting, or impact on the knee joint. Physicians rely on history, physical examination, and some imaging techniques in order to diagnose a meniscal tear. Specific manipulation of the knee joint might provoke classic popping or snapping of the meniscus, which makes the diagnosis highly likely. When a tear occurs on the outer rim of the meniscus, there may be enough blood supply for the cartilage to heal. However, the central area of the meniscus may never heal from a tear and require treatment. Patients who suffer from displaced pieces of cartilage in the knee, causing a “locking” sensation, may consider arthroscopic surgery the most likely form of treatment to reduce their symptoms and pain. This surgery is performed at a medical center on an outpatient basis using local anesthetic and small instrumentation to remove the displaced cartilage and transition the area of resection, leaving as much normal cartilage as possible. When the tear occurs on the periphery of the meniscus, surgical repair may allow healing and retention of the entire meniscus. In previous years these repairs were done using an open technique, but advances in technology have increased the success rate of surgeries performed arthroscopically. Post-operatively no weight bearing on the joint for three weeks is required to allow healing and protect the remaining meniscus from further injury. Return to previous activities, including running and other sports, occurs after three to four months when there is no pain in the joint, and strength and full range of motion have returned. In some cases the patient is not a good surgical candidate related to other medical conditions. The long-term concern following a meniscus tear is the development of osteoarthritis in the knee joint. Researchers from seven major universities studied 351 patients who had mild to moderate osteoarthritis and a meniscal tear. They studied the differences between conservative physical therapy treatment and arthroscopic repair. The researchers found no significant differences after six months between those individuals who underwent only physical therapy and those who underwent only surgery for rehabilitation and treatment of their torn meniscus. Thirty percent of the individuals assigned to the physical therapy group determined to undergo arthroscopic repair during the six-month study period. Whether surgery is considered or not, patients do better following a physical therapy regimen in which the muscles supporting the knee joint are strengthened and mobility is returned. Other options for treating the pain associated with a torn meniscus may include NSAIDs (non-steroidal anti-inflammatory drugs) and knee joint injections. Meniscus cartilage is located between the two large bones of the knee joint and is used to cushion the joint, prevent bone-on-bone rubbing, absorb shock and distribute the weight load across the knee. Where the meniscus damage occurs will guide medical treatment protocols prescribed. Tears along the outer rim are more vascularized and have a higher rate of recovery than those that occur in the central area of the meniscus. The meniscus may be torn related to an athletic injury or to the aging process as the cartilage becomes more brittle. Treatments include arthroscopic surgery to remove displaced cartilage torn from the meniscus and to trim the area, maintaining as much of the cartilage as possible. Both following surgery, or if patients are not good candidates for surgery, physical therapy will help to reduce pain, increase strength of the muscles that support the knee joint, and increase the potential that the patient will be able to return to prior activities.